Happy Little Bento: Green Drink! Green Drink, a photo by sherimiya ♥ on Flickr. I've been asked about my green drinks a few times, so I decided to write a bit about them. I just started making and drinking them for about 2 weeks, as one of my new year's challenges. So far, I LOVE them. Blend the remaining ingredients, in batches, so your blender won't blow its motor. If you have a high-powered blender, then just throw everything in at once. This recipe makes about 4 cups. I drink about 2 and a half cups at midday, and save the rest in the fridge to share with my kids later. It tastes.. well, green, but with a sharp, tangy, fresh bite. If you prefer it sweeter, you can add fruit. Even a couple of strawberries will sweeten it up quite a bit, but then the color will change. I really like it to stay greeeeeen. And it might be too soon to tell, but my usual winter allergies seem to be less pronounced. 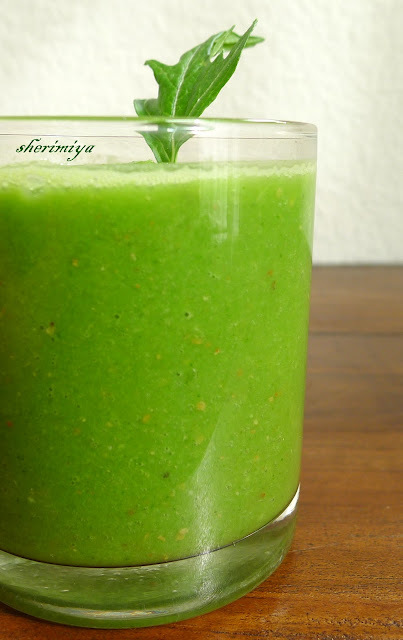 This drink will give you energy, fortify you for the day ahead, fill you up, and make you invincible! Okay, I made up that last part. Maybe. Wow, that's a lot of green! Have your eyeballs turned green yet? ;) I'll have to try this out as I want to get motivated to lose some weight and get fit again. Thanks for sharing! Vibrant colour. I'm already looking forward to seeing your favourite red one. It's the first time I ever hear about green drinks though, I'll have to google it up. Question about the dandelion greens: Is that something you can buy or do you go "hunting" for it in a garden? This is a great idea! ^^ I think that you can't juice most bitters without lightly heating them first, though. 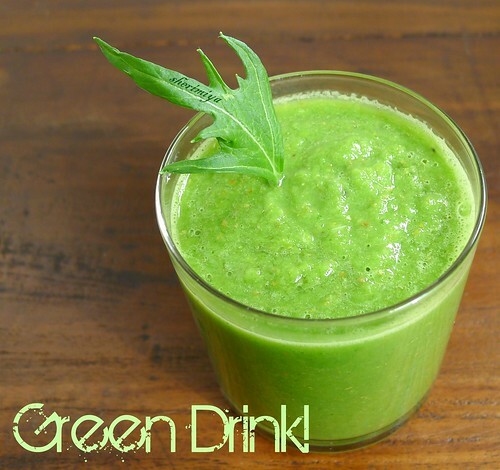 My green drinks always come out creamy and look more kale or avocado green. Oh, looks totally good! So green... I miss that vivid color. (hah! Only white here...). Tell me Sheri, do you use homemade almond milk too or buy it ready? hmm... made me remember my MIL´s wheatgrass juice... she tends to give me every Easter when we are at their place >_<. Sonoma Bento, nothing has turned green yet as far as I can tell! But I have been alternating with red drinks so maybe the colors have been cancelling out. Hope you can try it! AikoVenus, is that true? I haven't tried kale and choy because they are so thick that I'm afraid my blender won't be much help. I have used lightly steamed kale in my food processor and it chops fine but doesn't liquify. I can imagine that steaming more fully might help. Do you use dairy in yours? Banana also helps the creaminess in mine. so green! i like it. Coconut water was my favorite drink at the beach when I was younger. I just drank it plain, was a good thirst quencher. Difficult to find here but I believe it might be awesome mixed up in a power-juice ^^! You are right about the wheatgrass! Strong taste of "green"... >.<.